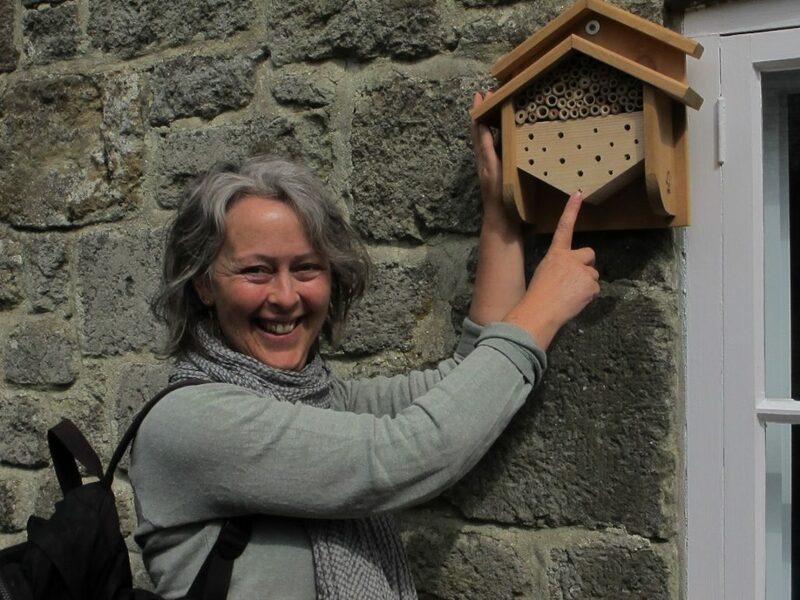 Renowned wild bee advocate Brigit Strawbridge has expressed her delight at discovering a perfect location at Gold Hill Museum for two nesting boxes provided by Shaftesbury Bee Group’s Big Bee Project. The boxes, funded by Shaftesbury Town Council, are designed to provide maternity homes for solitary cavity-nesting species such as Mason and Leafcutter bees. The bees fill tubes with pollen as food for their larvae, performing a vital role in plant pollination in the process. Their offspring pupate in the autumn and emerge as adults in the following year. These bees are harmless to humans and pets as they do not sting. Planting in recent years in the Wildlife Friendly Gold Hill Museum Garden by Ian Kellett and his late wife Marjory was always intended to be pollen-rich and attractive to insects and birds. The garden is free to visit during the daily 10.30a.m. to 4.30p.m. opening hours of the Museum, also free.